SMITHS FALLS, ON, June 18, 2018 /CNW/ – Spectrum Cannabis (“Spectrum Cannabis”), the global medical subsidiary of Canopy Growth Corporation (“Canopy Growth” or the “Company”) (TSX:WEED) (NYSE:CGC) is proud to announce the introduction of convenient, colour-coded Softgels to its product line in Canada. These innovative new products, available today, provide patients and healthcare professionals with a consistent dosing format for ingestible medical cannabis, supporting simplified dosing and a simplified conversation between patients and their healthcare practitioners. Each coloured Softgel aligns to the broader Spectrum Cannabis offering and contains a different ratio of THC and CBD to give patients clear options while also supporting healthcare professionals’ ability to make consistent treatment recommendations. The newly introduced Spectrum Softgels are the latest cannabis extract product introduced by the Company and reflect the growing desire for easy to use, medical cannabis products that go beyond whole-flower. As the clinical work of Canopy Health Innovations accelerates, value-add Spectrum Cannabis products will form the backbone of the Company’s ambitious global clinical reesearch framework. 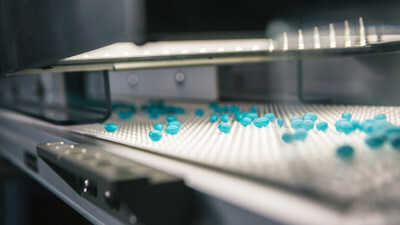 Spectrum Softgels are produced to exacting standards in the Smiths Falls GMP-1 certified production campus. Thanks to investments in industrial-scale facilities, customers and healthcare professionals can choose Spectrum Cannabis with the confidence that access won’t be restrained by inadequate supply. Knowing that product availability continues to be a challenge in the cannabis industry in Canada, and to back up its commitment to medical patients in the lead-up to recreational legalization, the Company is committing to its customers that Spectrum Cannabis Softgels and oils will always be in stock moving forward. Launching Spectrum Cannabis Softgels builds on recent announcements that upon the passing of the Cannabis Act, the Company will absorb the proposed excise tax on all Spectrum Cannabis products sold in Canada, including our new Softgels offering. On top of this, all Spectrum Cannabis dried flower products will be priced at $8.50 per gram or less and, as always, Spectrum Cannabis products in Canada are eligible for our industry-first Compassionate Pricing Program that helps those on limited incomes afford their medicine. This news release contains “forward-looking statements” within the meaning of the United States Private Securities Litigation Reform Act of 1995 and “forward-looking information” within the meaning of applicable Canadian securities legislation. Often, but not always, forward-looking statements and information can be identified by the use of words such as “plans”, “expects” or “does not expect”, “is expected”, “estimates”, “intends”, “anticipates” or “does not anticipate”, or “believes”, or variations of such words and phrases or state that certain actions, events or results “may”, “could”, “would”, “might” or “will” be taken, occur or be achieved. Forward-looking statements or information involve known and unknown risks, uncertainties and other factors which may cause the actual results, performance or achievements of Canopy Growth or its subsidiaries to be materially different from any future results, performance or achievements expressed or implied by the forward-looking statements or information contained in this news release. Examples of such statements include: “convenient and precise dosage for patients”, “give patients clear options while also supporting healthcare professionals ability to make consistent treatment recommendations”, “reflect the growing desire for easy to use, medical cannabis products that offer an alternative to inhalation.” Risks, uncertainties and other factors involved with forward-looking information could cause actual events, results, performance, prospects and opportunities to differ materially from those expressed or implied by such forward-looking information, including availability and distribution of product, and such risks contained in the Company’s annual information form dated June 28, 2017 and filed with Canadian securities regulators available on the Company’s issuer profile on SEDAR at www.sedar.com. Although the Company believes that the assumptions and factors used in preparing the forward-looking information or forward-looking statements in this news release are reasonable, undue reliance should not be placed on such information and no assurance can be given that such events will occur in the disclosed time frames or at all. The forward-looking information and forward-looking statements included in this news release are made as of the date of this news release and the Company does not undertake an obligation to publicly update such forward-looking information or forward-looking information to reflect new information, subsequent events or otherwise unless required by applicable securities laws.